KATIE: Is it Tuesday already? 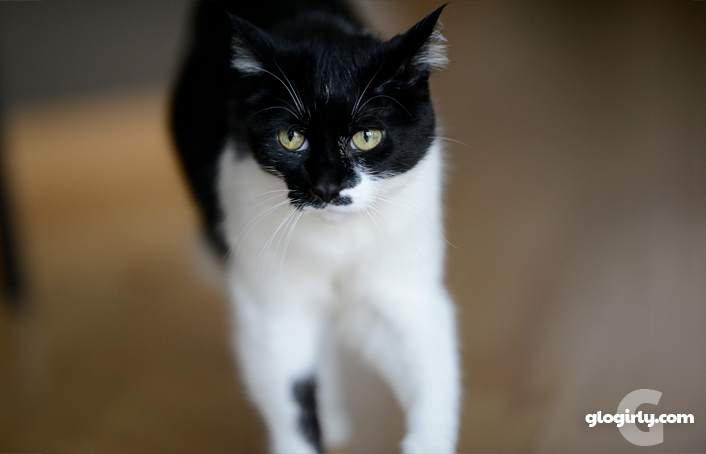 Last week when Waffles hijacked #TuxieTuesday... as if we all don't get enough of him already... my devout Katie fangirls (and fanboys) cried out in protest. 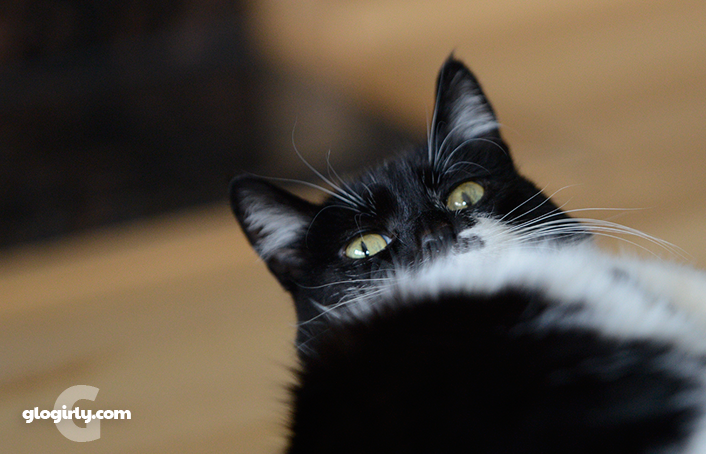 "What happened to #Tuxie Tuesday?" So today, it's all about me. KATIE: *sigh* I thought this thing tasted a little OFF. Today's photos bring back painful memories. They were taken last year, just shortly before the first day of spring. It was a Friday. No, a Saturday. March 15, 2014. The day the nip nanna died. We received 'Nanna' that very day from the man in brown shorts. Well, it was cold so he probably wore pants. Glogirly opened the box and held up the beautifully fragrant and pristine nip nanna. So bright and yellow. She was magnificent. While Glogirly was getting her camera ready, Waffles got a hold of her. Nanna, that is. What happened next was horrifying. Puncture wounds everywhere. Poor Nanna didn't stand a chance. Within 15 minutes, Nanna sprung a catastrophic leak. Katie tried to help, but it was too late. Nanna was laid to rest in the kitchen garbage can. She was later moved to the garage, where her remains were safe from Waffles the scavengers. Wow, Waffles is a little rough on those toys - it takes Binga and Boodie months to destroy those Yeowww! ones. Oh dear. The Farm cats love the nip nanna. Ours has lasted almost two years and four cats. Waffles is a BEAST. Too bad bout da nanner. Waffles needs to pay compensation!! Those 'nanners aint cheap!!!!!! Maybe Waffles' toofies are less sharp now than when he was young. Perhaps give another Nanna a try. They are the best! We saw our Mom sneak in a new Nanna a few days ago! Poor Nanna... ours never got that fast! But we LOVED seeing gorgeous Katie!! Aw, poor Katie! You should demand a new nana, one that Waffles isn't allowed to touch! Poor Nana, don't worry, they are like goldfish- plenty more at the pet store. Holy cows Waffles..I don't think any of my kids could destroy a Nip Nana in one day..or less..mol..Not even the orange kid and he can get purrtty rough..
We have a couple of dead Nannas around here - also a dead Yeooww fishie. Julio doesn't seem to care if they're dead or alive. He flings the dead ones around and chews them just as if they were alive. Julio is not fussy. At the moment, he is behind me, trying to slay a clothespin. Nothing fancy. No catnip. Just a clothespin. Hey, he's a cat. We're so sorry to hear about the sudden demise of the Nip Nanna. Did you buy two the next time around? Inspired by today's post, I have just purchased a Nip Nana for our gang. They are usually pretty gentle with toys, so we'll see how long it lasts. I was going to say, those were some pretty impressive fang marks in that nanner..
Poor Katie, poor nanna! I have had my nippy nanner for years and give it a regular good bunny kicking. Truffle is pretty rough on her nannas, too, Brulee just licks them. OMC Dat's pawful!!!! Yous all not have a nip nana? Weez fawt we was hawrd on toys. Weez not got any holes in our mammers. But we do luv to see yous bootyful Katie. Have a gweat day. A nip nanner in the trash?? Mudpie is horrified! What a tragic nana incident. That's as bad as the brand new Nana that Newton got territorial about and peed on. Seeing a new nana have to leave so soon is a real heartbreaker. RIP Nanna. Katie, you have to admit it would be handy to have Waffles on your side in some sort of Intelligent Dog Uprising, for example. But he's a real menace when it comes to household items, like TP or your favorite toys. 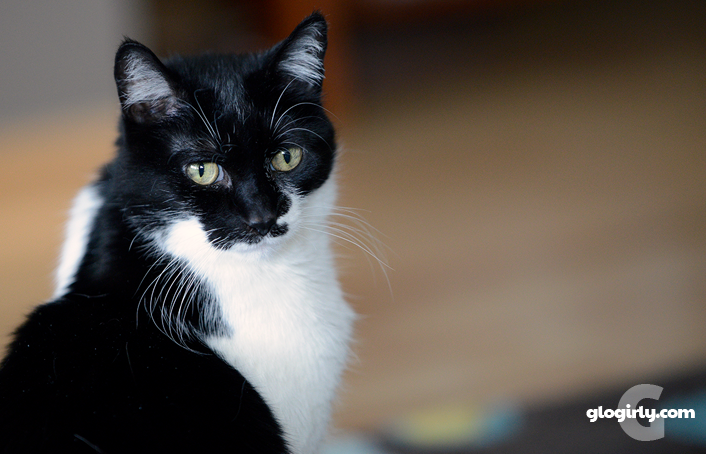 We LOVE Tuxie Tuesday! Yeah, mum owes me a new nip nanner or carrot. Lost there punch. 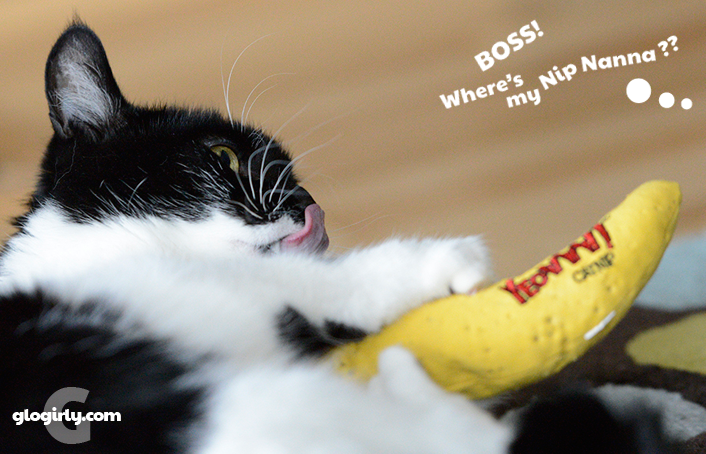 OMC I didn't know a nip nanner could be killed that easy!!! We have had ours for over a year and just nibble on them and rub them lovingly. Sorry Katie that you did not get to fully enjoy as you should have.